Last month Mercedes-Benz released official spyshots of its new C-class Coupe doing the rounds on a test track. Now, it’s just released official images as the coupe drops its camo for the first time. Mercedes says the latest 2016 two-door C-class is an improvement on its predecessor, adopting the new smooth lines of all the Mercedes ranges. Sales start in December 2015 and it will make its public debut at Frankfurt motor show in September. 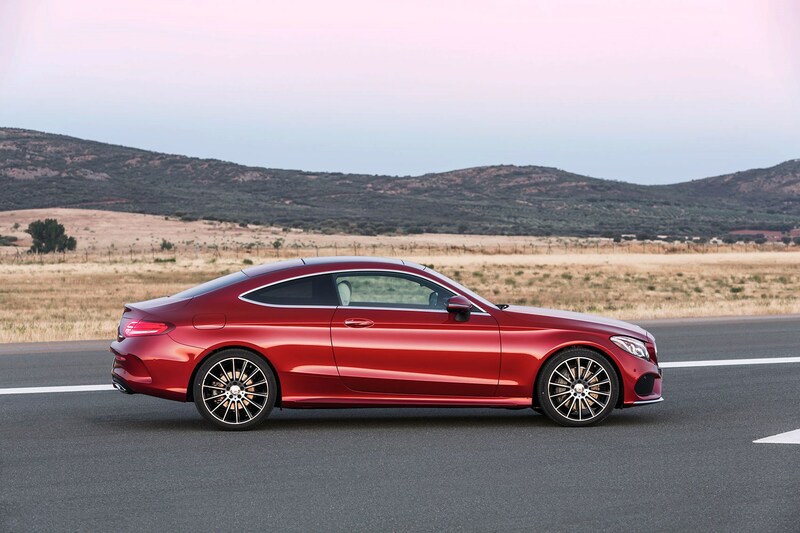 The new Mercedes C-class Coupe features the German premium brand's new Airmatic suspension. Sitting 15mm lower than the saloon; the sporty intention is supported by the AMG line’s body kit that is available as an optional extra. The new suspension features continuously adaptive damping, with 5 driving modes: eco, comfort, sport, sport + and individual - the latter being controlled by the driver who can adjust the settings to his or her own driving style. According to Mercedes, the new C-class coupe is 95mm longer and 40mm wider, with a 80mm longer wheelbase. Its intention was to increase the space inside for passengers. The new coupe is also lighter than its predecessor, although Mercedes hasn’t released details of how much this weight saving is. It says the coupe has achieved this by using lightweight components in the construction of the bonnet, boot lid and wings. Unfortunately, there’s no mention of the C-class AMG coupe. Two diesel engines will also be on offer with 170bhp and 204bhp. Although there is no mention on official timing specifications of each model. As we approach an autonomous future, there’s no surprise the new C-class coupe comes with an incredibly long list of assistive gizmos to help make driving easier and safer. We’ll begin with the standard features. Attention Assist alerts the driver when it senses they are become drowsy. Collision Prevention Assist Plus with adaptive brake assist detects vehicles braking ahead and applies the brake if the driver doesn’t apply enough force. Now entering the options list… Distronic Plus essentially mirrors the car in front, if it brakes then your car will slow to prevent a collision, the same goes for if it speeds up. This could be an ideal feature in bumper-to-bumper traffic. Adaptive High-Beam Assist detects on-coming vehicles and automatically dims the lights accordingly. BAS plus Brake Assist detects crossing traffic behind you, ideal for those bumping into others whilst reversing out of parking bays. Active Lane Assist will stop the car from unintentionally drifting out of lane. Pre Safe Plus detects imminent rear shunts, it works by flashing the hazards at a higher intensity to usual to warn other drivers, and will also lock the brakes to prevent further collision in front, and also adjust the tension of the seat belt to prevent as much movement as possible. Active Parking Assist will allow drivers to use semi-autonomous parking. A 360degree camera is also available as an option if you prefer to park the car yourself. Despite the huge number of assistive features, Mercedes state that this is its most sporty C-class coupe yet.